After a fairly impressive performance against the Packers, winning 21-13, the Chargers will continue their preseason campaign against the Dallas Cowboys on Saturday night. The Chargers will first of all try and prevent any injuries to their starting players, but also try and build on certain aspects of their game in preparation for the regular season opener against the Raiders. First of all they need to establish the ground game. With Ryan Mathews out for 4-6 weeks with a broken clavicle (collarbone), the Chargers will look towards the likes of Ronnie Brown, Jackie Battle and Curtis Brinkley to compete for a possible starting role. Ronnie Brown is considered as favourite for a starting job if Mathews does not return for week one but the coaches want to leave the position open to fight for. Le'Ron McClain has often aspired to rush the ball himself and we could see a few handoffs going his way so he can show what he can do. Norv Turner however will certainly be aware of the big Full Backs ability to be one of the best in the business for making holes in the defence for the backs to run into so he may not see a large role at tail back. Edwin Baker and Michael Hayes will also receive a chance to get the ball but they will need to make a fairly big impact in the coming games to feature often in the regular season. 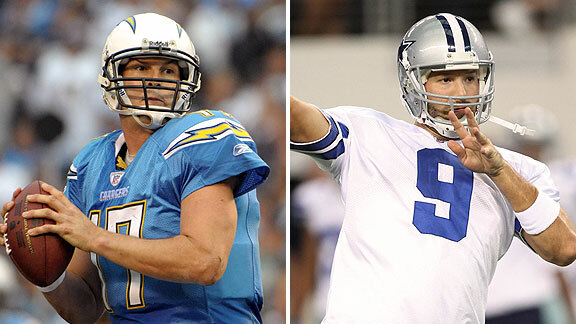 Philip Rivers will aim to avoid getting turned over against Dallas and begin to put an end to his recent tendency of throwing interceptions. Jarrett Lee, who impressed in his first game in the NFL, will be looking to build on his previous performance once Turner feels Rivers has done enough. The receivers will continue their battle to impress the coaches with Floyd and Meacham fighting for that number one receiver position while Eddie Royal and Vincent Brown attempt to be the teams Primary slot receiver. On the defencive side of the ball, rookies Ingram and Reyes will look to continue their successful start to their careers. Melvin Ingram, considered the best outside linebacker in the draft, showed off his pass rushing skills against the Packers last week and is sure to be a force in the league in coming years. Larry English, one of Ingram's fellow outside linebacker, has struggled with injury in previous years but managed to show off his pass rushing skills on defence last week and will look to earn himself more reps on defence in the competitive crop of linebackers that San Diego now owns. These are just a few players looking to carry on impressive performances, however nearly every defencive player gets a few reps in preseason so really any player has a chance to jump out and impress even if its merely fighting for a backup role. Other former first round picks like Corey Liuget will also be trying to show their worth and justify their selections. One final pair of players battling it out is the pair of kickers on the roster. Nate Kaeding will be looking forward to putting his previous season behind him when he was injured on the opening kickoff, while Nick Novak, who was brought in as a replacement last season, will be hoping for an improvement of his performance against Green Bay where he missed his only attempt. Although Kaeding is a better kicker, he has a much larger contract and he has shown in the past that he cannot cope with the pressure of kicking post season field goals.As it is rare for a pair of kickers to be on the same roster in the regular season, both will be looking to avoid the dreaded cut. Either way tonight's game promises to throw up some intriguing competitions and Charger fans will be hoping to see if some players can stand out from the rest. Highest on the wish list for coaching staff and fans will be for a running back to prove himself to be ready to start week one with the absence of Ryan Mathews.